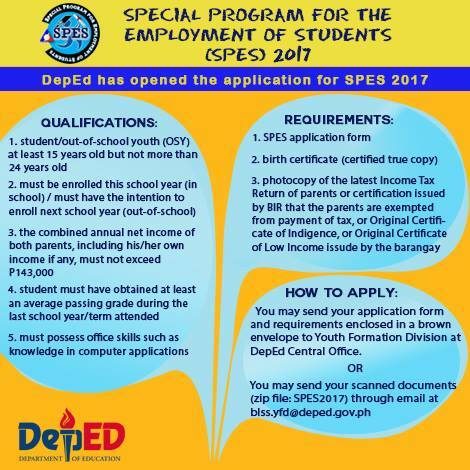 This is a guide for students and teachers who want to know more about the Special Program for the Employment of Students or SPES by the Philippine government through the Department of Education (DepEd) and the Department of Labor and Employment (DOLE). Qualifications: Who is eligible to apply? 1. Students or out of school youths (OSY) who are at least fifteen (15) years old but not more than twenty-four (24) years old. 2. Applicant must be enrolled this year meaning he/she is currently in school or he/she has plans of enrolling in the upcoming school year. 3. The combined annual net income of the applicant's parents should not exceed 143,000 pesos. That's approximately 12,000 a month for both parents. If the applicant also has a steady source of income, this will be included in computing the family's total annual income. 4. The applicant must have obtained at least an average passing grade during the last school year or school term that he/she attended. 1. The applicant must completely fill up the SPES application form. 2. The applicant must present a certified true copy of his/her birth certificate. This document can be obtained from the National Statistics Office (NSO) or from the applicant's place of birth. 3. The applicant must submit a photocopy of the latest and updated Income Tax Return (ITR) of his/her parents or a certificate issued by the Bureau of Internal Revenue (BIR) stating that the parents are exempted from paying taxes, or an Original Certificate of Indigence, or an Original Certificate of Low Income as issued by the applicant's barangay of residence. 5. For applicants who are out of school youth (OSY), they must submit an original copy of Certification as OSY issued by the DSWD/CSWD or the authorized barangay official where the OSY resides. 1. Get a true and certified copy of your birth certificate. 2. Get a copy of the application form and fill it up. 3. Get a photocopy of your parents's latest Income Tax Return (ITR). 4. Put your application form and other necessary documents in a sturdy brown envelope then send it to Youth Formation Division at the DepEd Central Office. 5. You can also scan your documents and send it via email using the following email address: blss.yfd@deped.gov.ph. Don't forget to use the keyword "SPES2017" in naming your zip file. Those applicants who will pass the screening process will be employed by DepEd for a duration of forty (40) working days. They will always be supervised by the Youth Formation Division. Application will only be accepted until March 27, 2017.